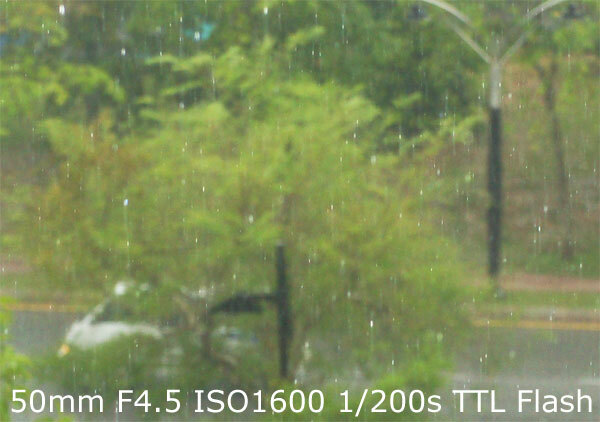 Can you use the Sony 18-70mm F3.5-5.6 DT kit lens to freeze rain? Perhaps. I don’t have a kit lens, but the 50mm F1.4 will do for this experiment. I manually focused to 5 meters. The following are about 39% crops off an A900 at 24 megapixels. That means I cropped an image 1540 pixels wide (making a 100% crop) and shrunk it to 600 pixels wide (thus becoming 39%). 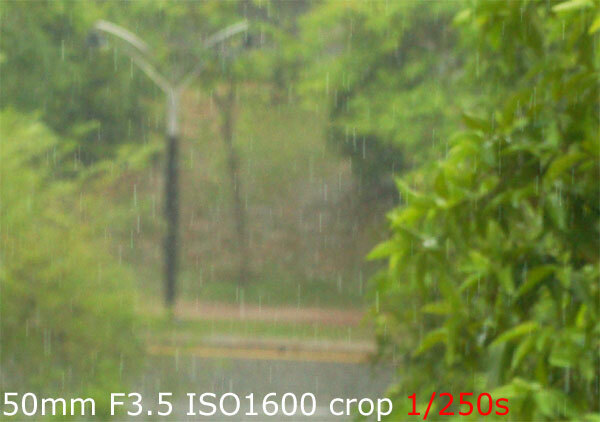 At F3.5, Aperture Priority selects a shutter speed of 1/250s. Flash was not used. Yes, this was at 50mm, where the kit lens would already say F5.6. However let’s presume you were shooting at 18mm wiiide. 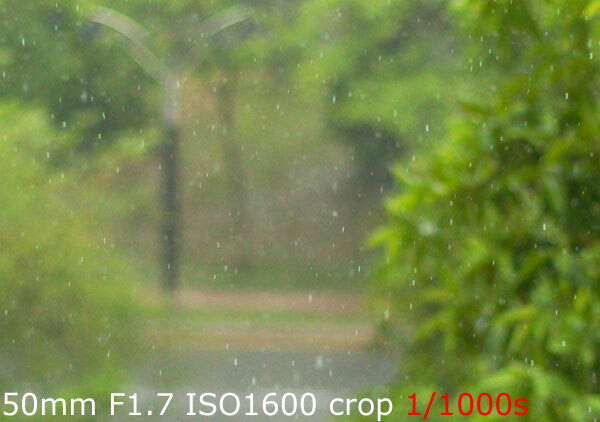 At F1.7, Aperture Priority selects a shutter speed of 1/1000s. Flash was not used. 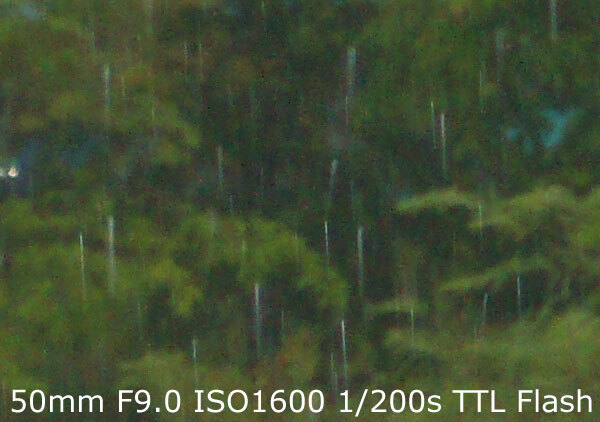 As you can see, there is a big difference in the length of the raindrops, due to the shutter speeds used. So what if we used flash? At F4.5, 1/200s (well within the flash sync of the A900) and using pre-flash TTL. You can see two elements to a raindrop – the slow shutter (1/200s) giving the long raindrop, and the flash giving the short, brightly lit part of a raindrop. I should’ve used rear sync flash for this. Now what if we used a darker aperture? At F9.0 and using pre-flash TTL. The raindrop streaks from the flashes are longer! Why? A flash always fires at full power, it’s just the duration of that full power blast that changes. Confusing? Yeah. That’s why I still call it flash power even though I know it’s not technically true. So for a 1/1 blast, your flash is actually on for a longer time than if you use a 1/4 blast. So, at a brighter aperture, your flash will use a smaller power say 1/32 and its duration will be shorter also. This will ultimately make it easier to freeze motion. More shots of frozen rain here. This entry was posted in Geek, Pictures on May 22, 2009 by 2konbla.